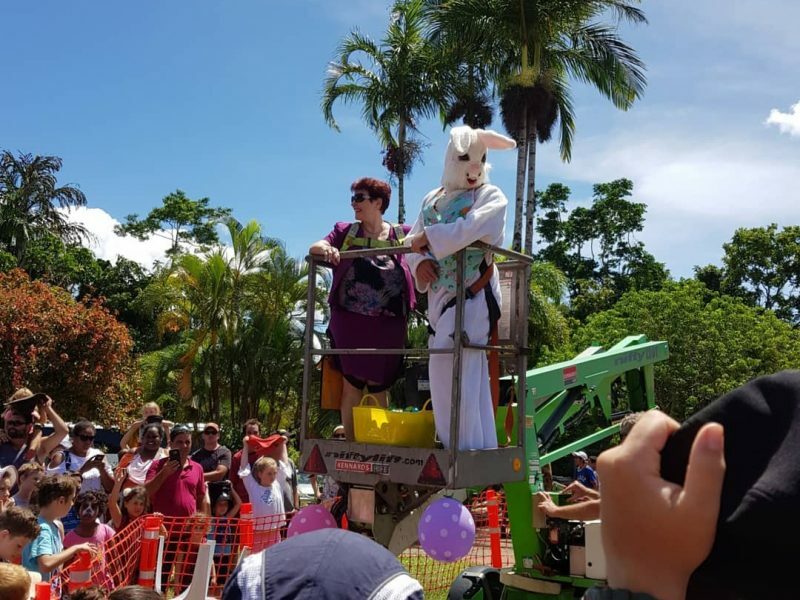 Kuranda is a buzzing town, no more so at Easter when the Great Easter Egg Drop breaks records – not eggs. Fifteen thousand chocolate Easter eggs rain down on the rainforest town, the climax of Easter in the Park, which sees the tourism mecca open throughout the holiday weekend. The 15,000 Easter eggs are a sight to behold and for one lucky egg grabber there’s a Golden egg Kuranda prize package. And the egg drop is not just one batch – eggs are released on the hour every hour during the big day. This family event is a lot of fun for the town and visitors; Easter Bunny, circus acts, street entertainers, magicians, cultural dancers and face painters are regular attendees. The under fives get their own protected space so they have an even chance of catching eggs – and meet the Rabbit of the Hour. There’s also lots of stalls around the park and other activities such as jumping castles, games and horse and carriage rides. It’s a time to let your hair down and get your hands up in a place that’s synonymous with a laid-back vibe. Easter in the Park is at Centenary Park on April 20. All year round there’s lots going on in this colourful village high in the sky from the markets to the wildlife attractions to the walking trails, boat and jungle tours plus scenic rail journey and gondola ride over the canopy. For the active among us, the Speewah Legend Footrace is held every year in July. It doesn’t take itself too seriously – Speewah is described as the place that “lies west of the sunset, a place where crows fly backwards to keep the dust out of their eyes and the trees are so big their tops are hinged, to let the sun go past.” It’s about 5 minutes from Kuranda. This running event is part larrikin part local history – the courses head through into the Barron Gorge National Park via the Djina Wu track, following paths of the Djabugay and the pack and dray routes of early European settlers. There are several race lengths from 4kms to 17kms with runners encountering rainforest, crystal clear creeks, shady trails and a few tough climbs soothed by gentle downhill runs. This year’s Speewah Legend Footrace is on July 21. If you are planning a trip to Kuranda in 2020 you are in luck – it may coincide with the Kuranda Roots Festival. Taking a break this year, the Roots Festival is usually held in June and this ultimate camp out musical experience offers reggae, soul, drum’n’bass, dancehall, ska and traditional music in lush surroundings. It’s the area’s longest running festival of its type and will be welcomed back in 2020 with open arms.